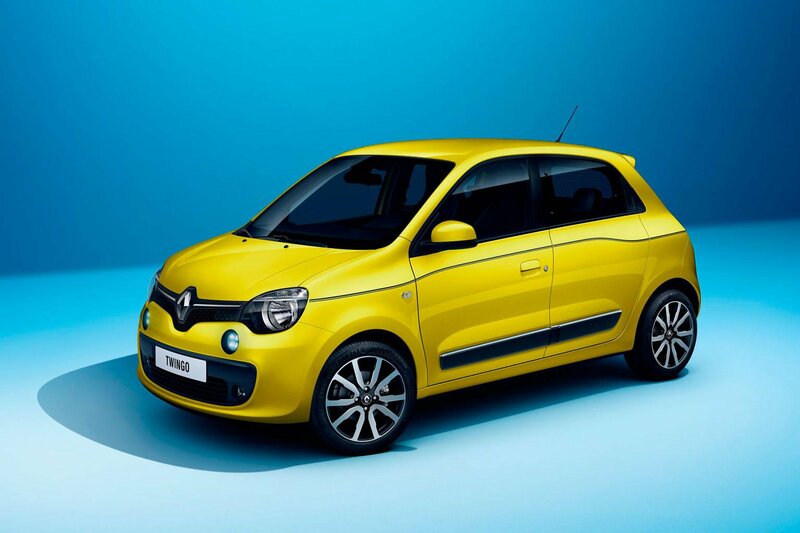 New Renault Twingo revealed | What Car? This is the new Renault Twingo, which adopts a radical layout in a bid to pack in more passenger space than the two earlier editions of the city car. Unlike almost every small car on sale today, the Twingo is rear-wheel drive and has its engine mounted beneath the boot floor. View the new Renault from the side and it's easy to see that its wheels are pushed to the corners, especially at the rear. Also noticeable are the unusually short bonnet and the absence of any air scoops in the rear wings; the engine’s cooling is handled by the conventional grilles at the front and the intakes beside the rear numberplate. In another first for the Twingo name, the car is available only as a five-door; the rear door handles are hidden in the black plastic just beyond the side windows. Renault says that its engineers concluded that a low-mounted, compact engine tilted on its side beneath the boot floor offered the best chance for extracting more cabin space. The firm hasn't released any details on the new car's interior, though; it's expected to issue more information and measurements when the car makes its public debut at next month's Geneva motor show. Daimler is largely to thank for the Twingo's unusual layout. In 2010 Renault and Daimler decided to collaborate on the development of their new city cars, and because a rear-mounted engine is essential for the two-seat, two-door ForTwo, it has become so for the Twingo, too. Smart’s ForTwo will be much smaller than the new Renault, but the firm will also offer a five-door Smart ForFour that is a heavily restyled version of the Twingo. Engine details are still scarce, but we'd expect two petrol motors to be offered; at least one of these should be the three-cylinder turbocharged 0.9-litre unit that we've already seen in the Clio and Captur. We'd expect it to deliver fuel economy of nearly 70mpg and CO2 emissions of well under 100g/km. The Twingo is chasing Fiat 500 and Vauxhall Adam customers by offering new scope for personalisation. The pictures released so far reveal that there will be stickers and stripes, various alloy wheel designs and the option of a full-length fabric sunroof. Some of the Twingos shown in the first set of images have a sportier look, and while sources deny that there's a Renaultsport version on the way, unofficial rumours suggest that the performance division is already studying how to turn the car into a baby hot hatch rival for the Fiat 500 Abarth. The Twingo is due on sale in late summer 2014.